Lepchajagat literally meaning the world of the Lepchas, the original tribe of Eastern Himalayas is now a beautiful tourist destination famous for its romantic atmosphere and sunrise point. Located at an elevation of 6,956 feet, Lepchajagat offers a fascinating sunrise from the Ghoom Rock which is unparalleled in its appeal. 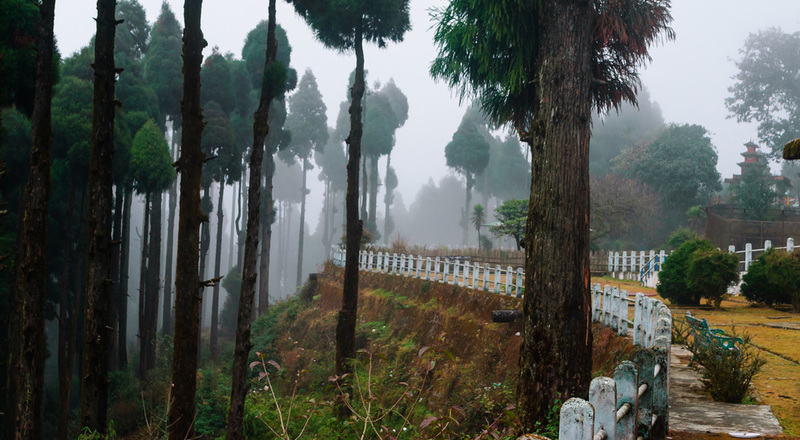 Though the place is located at a short distance of 19 kilometers from Darjeeling main town and is only 45 minutes drive from Ghoom, it seems like a completely different world. Quiet, tranquil, romantic; it is an ideal destination for honeymooners to spend time each other forgetting all about the world. Lepchajagat is now a reserved forest area maintained by the West Bengal Forest Development Corporation. Chatakpur Eco Resort is located on Siliguri-Darjeeling Road and is only 7 kilometers from Sonada and 18 kilometers from Jorbanglow. Enjoying an elevation of 7887 feet, this lovely little hamlet has only 90 villagers and is being developed by the forest department as an eco resort for tourists. It is an ideal destination for people seeking peace and quiet in the Himalayan Mountains. Amidst the lush greenery, wooden cottages, forest trails and the majestic Kanchenjunga, this is a paradise on earth. The best place for bird watchers, Chatakpur offers that much awaited freedom and freshness from the confined city life.